May 6, 2018: The Paramount Theatre on the famed Jersey Shore boardwalk was the setting for the 10th annual ceremony of The New Jersey Hall of Fame. The distinguish class of 2017 included astronauts, sports greats, rock stars, business titans and other great New Jerseyites. The evening was hosted by Whoopi Goldberg and the house band was led by New Jersey’s Glen Burtnik (formerly of Styx). 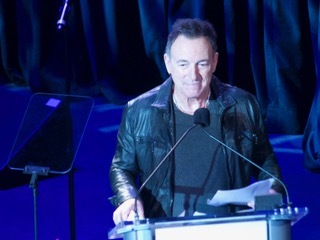 It was a memorable evening with entertainment by such greats as Tommy James, Steven Van Zandt, Gloria Gaynor, Marc Ballas, Joe Piscopo, and the surprise guest was New Jersey favorite son Bruce Springsteen. Bruce and Seven Van Want, rocked the house singing a duet “I Don’t Want to Go Home”. ARTS & LETTERS: Author Harlan Coben and author/journalist Anna Quindlen. PERFORMING ARTS: , musician and actor Steven Van Zandt, the band The Four Seasons including members Frankie Valli, Bob Gaudio, Tommy DeVito, Nick Massi and Joe Long, singer Gloria Gaynor, and singer-songwriter Debbie Harry of the band BLONDIE. PUBLIC SERVICE: Astronauts Mark and Scott Kelly, nurse Clara Maassand politician Millicent Fenwick.